MANILA, April 30 -- The Philippines' successful hosting of the 30th Association of South East Asian Nations (ASEAN) Summit concluded with leaders working towards the realization of ASEAN Vision 2025. 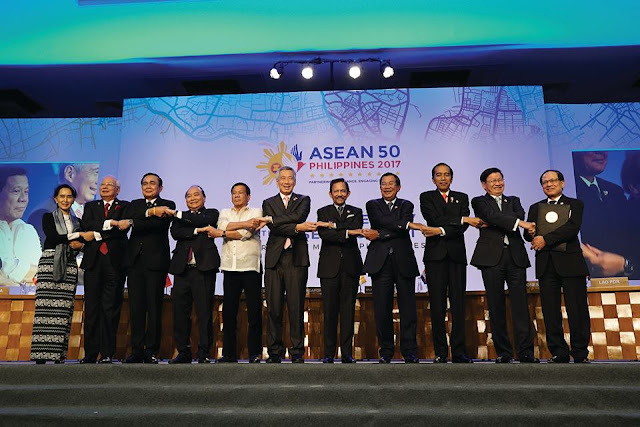 "At the 30th Summit of ASEAN, we had engaged in a productive and fruitful deliberation of ASEAN’s work in the community of building process," President Rodrigo Roa Duterte said in a press conference on April 29. "We also discussed the implementation of the blueprints and work fronts of the three community pillars: the political security community, the economic community, and the sociocultural community as we work towards the realization of ASEAN Vision 2025," he added. The major highlights of activities of the Summit Week included the state visit of His Majesty Sultan Haji Hassanal Bolkiah Mu'izzaddin Waddaulah of Brunei Darussalam on April 27. President Duterte welcomed Sultan Bolkiah in Malacañan where both leaders witnessed the signing of bilateral agreements aimed at promoting cooperation between the two countries in the fields of culture and the halal industry. In the evening, he hosted a state banquet for the Sultan of Brunei whose country is considered by the Philippines as its "most valued friend and ally." The next day, April 28, President Duterte welcomed another state visitor, Indonesian President Joko “Jokowi” Widodo in Malacañan where the two leaders agreed to further strengthen cooperation on areas of mutual interest. They witnessed the signing of the Memorandum of Understanding (MOU) on Agriculture and the Joint Declaration on the Establishment of Sea Connectivity between Davao, General Santos in Southern Mindanao, and Bitung, North Sulawesi, which Duterte and Widodo led its formal launching in Davao City on April 30. Prior to the state banquet, President Duterte attended the 14th ASEAN Leadership Forum, highlighting the importance of inclusivity in uplifting the lives of the people in the region. Duterte said that as ASEAN continues to work together in shaping positive changes, it must also pursue greater international engagement to advance common interests. During the Summit Week, the Philippines also exchanged views on regional and international issues of common interest and concern as it acknowledged the importance of ASEAN cooperation in addressing issues that affect peace, security, and prosperity of the region -- that included addressing the problems on terrorism, violent extremism, piracy, human trafficking, poverty and illegal drugs. There were also the productive engagements with parliamentarians and the youth of ASEAN. "We look at the progress of our cooperation with external partners and the future direction of ASEAN’s engagement with them, noting the importance of ASEAN Centrality which shows that relations only bear fruit if cooperation is anchored on mutual respect and benefit," President Duterte underscored on April 29 in his speech during the 30th ASEAN Summit opening ceremony. Following the Summit's launching, President Duterte along with other nine leaders of the ASEAN Member States signed the ASEAN Declaration on the Role of the Civil Service as a Catalyst for Achieving the ASEAN Community Vision 2025. They officially adopted a declaration which underscores the significance of the civil service as the backbone of good governance in the region and its role for enhanced cross-sectoral and cross-pillar cooperation in ASEAN community building and in providing support to furthering regional integration. Alongside the Summit's opening, Duterte's common-law wife Cielito "Honeylet" Avanceña, meanwhile, toured the spouses of the ASEAN heads of states to the National Museum. She also hosted a luncheon and watched a cultural presentation with them. First Ladies Iriana Widodo from Indonesia, Naraporn Chan-o-cha from Thailand, Tran Nguyen from Vietnam, and Naly Sisoulith from Laos joined the tour. At the 30th ASEAN Summit Gala Dinner, President Duterte feted the ASEAN leaders and their spouses to a night of good food and entertainment. He likewise proposed a toast for the stability and continued success of the Southeast Asian nations. After a productive week of open discussions, sharing inputs, and exchanging of views, President Duterte thanked the ASEAN leaders during the Summit's gala dinner.